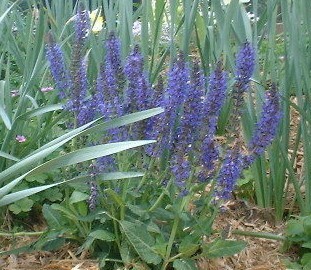 Salvia is part of a large family of plants, including the familiar herb, Sage. This family encompasses Annual, Biennial, and Perennial plants, some of which grow to shrub size. All plants in this family have the same basic properties as Sage, but not all make the great medicinal and culinary herb that is inherent in common Sage. Therefore this page is dedicated to the ornamental members of this very valuable plant family. Salvias in the ornamental garden can serve many purposes. They can be used in mass plantings, can add a colorful and decorative touch to Containers, and make excellent cut flowers. Some emit fragrances when brushed or touched, and are good choices to consider when planning for a fragrance garden. Most members of this family attract hummingbirds, bees, and butterflies, and are important parts of an overall Backyard Habitat plan. Salvias make bright additions to dried flower arrangements and potpourris, and depending on the particular cultivar, can be used as edging plants or as tall background screening plants. Propagate Salvias by seed or cuttings taken in the spring before flowering. Root divisions can also be done in the spring, but take care to give the plant good conditions throughout the first summer, as it may be slow to establish a new root system.